This is a new season that requires a new perspective and new strategy. I believe the Lord is asking believers to “reset” their hearts and minds in order to properly interpret what is happening around them. There are dark forces at work in the root system of this nation due to unholy alliances and covenants between individuals who seek power and control. These are anti-Christ alliances that have been at work for decades slowly infiltrating our collective mindsets causing widespread deception and unbelief. Though we have rampant immorality in the land, the major problem in this nation is not a morality issue, but a covenant issue. God is looking for believers who are free from control and manipulation in order to pray effectively and discern rightly. If we want to walk in the Truth and rightly distinguish between what is of the Spirit, the flesh, or the Devil, we must clear our own hearts of any ungodly alliance, covenant, or soul tie that would hinder our ability to perceive correctly. Just as we can have soul ties with individuals (Proverbs 22:24-25), so we can have soul ties with organizations, denominations, genders, races, even ideologies that are no longer applicable (see Scriptures below). Some of these alliances may not even be “bad”, yet if we depend upon them for security, reputation, or identity, we must free ourselves from their hold on us. Even good causes can become idols in our lives if we let their influence become greater than the current working of the Holy Spirit. Much of the lack of discernment in the body of Christ right now is because of these types of alliances (agreements), both in mind and spirit, that are keeping many in the dark. To be specific: if you have pledged allegiance to a certain denomination, the enemy can use that to blind you to any other expression of truth. If you are bound to a particular political party (because of family history or lifelong record) the enemy can use that to limit your ability to see any other perspective. You can also be bound to social issues that keep you so focused on one idea that you are not free to see anything else (abortion, racial justice, sexuality, etc.). Causes are not necessarily “wrong”, but they can have a hold on us. If we are not able to adjust to a new perspective because of past affiliations, agreements, or alliances, we are bound and have limited spiritual perception as well as limited spiritual authority in prayer. Until these unhealthy agreements are broken, God’s blessing cannot come. For when Solomon was old, his wives turned his heart away after other gods; and his heart was not wholly devoted to the LORD his God, as the heart of David his father had been (I Kings 11:4). 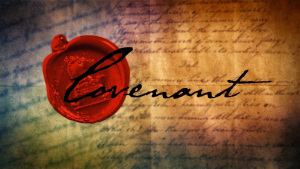 God blesses covenant relationships where parties are walking in obedience to His Word and submitted to His Spirit. Any covenant or alliance that puts the influence of others over and above the Holy Spirit will not only block God’s favor and blessing but also work against it and blind us to His Truth. This is true on a personal level and it is now being played out on the national level. Here are some prayer points with Scripture that address this issue. Pray these over yourself as well as the nation so that we, as believers, will be truly free to have the mind of Christ, the heart of the Father, and a heavenly, eternal perspective on the days we live in. Renounce any unholy alliance or mindset and declare your allegiance to the Lord Jesus and the Spirit of Truth. Declare that we would love the Lord God with all our hearts, minds, souls, and strength and that no other force of our flesh or this world would draw us away from our full devotion to Him, alone. Thank you for this is insightfully true and a wonderful navigational aid to help steer the course out and away from Egypt and Babylon.